Empire has been one of the worst companies I have ever tried to work with. We scheduled a day for our carpet to get installed 2 months in advance and when it came down to the day of installation we never got a call in the morning to confirm installation for that day. We had to call customer service just for them to tell us that they can not get ahold of the installer. 11am rolls around and after we called Customer service again we got a time frame between 1:00pm-2:00pm(they never showed). We got a call around 3:00pm from the installer to tell us that they would be to our home at 5:00pm. Well to our surprise 5:00pm rolls around and the installers still did not show. We waited till 6:00pm to call Customer service again to get no help. Around 7:00pm we finally got a call from the installer just to tell us they would not make it out to install our carpet today, and that the installer manager would be contacting us tonight. And of course still no call from the manager. We have our house torn apart, bedrooms furniture in the dinning room and have been waiting around all day and do not have our carpet installed on the day we paid a hold to have it installed. VERY VERY UNPROFESSIONAL. And recommend that you look else where for service. 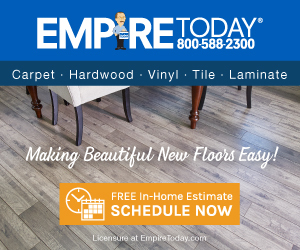 Product or Service Mentioned: Empire Today Carpet Installation. Review #794389 is a subjective opinion of User794389.